Looking for a contemporary or modern bathroom splashback to make your property stand out in Melbourne’s ultra-competitive home market? Ceramic tile is the conventional choice, thanks to its low cost and multitude of options. Yet high-end buyers are looking for detail well beyond conventional. Stone slabs like granite, marble or sandstone are popular choices, but their non vitreous composition means the backsplash needs extra sealing maintenance. So, to avoid these drawbacks and upgrade to a sleek, modern look, many designers are choosing glass bathroom splashback applications. The benefits go far beyond style. This splashback choice adds value to any bathroom for cleaning and moisture protection as well. 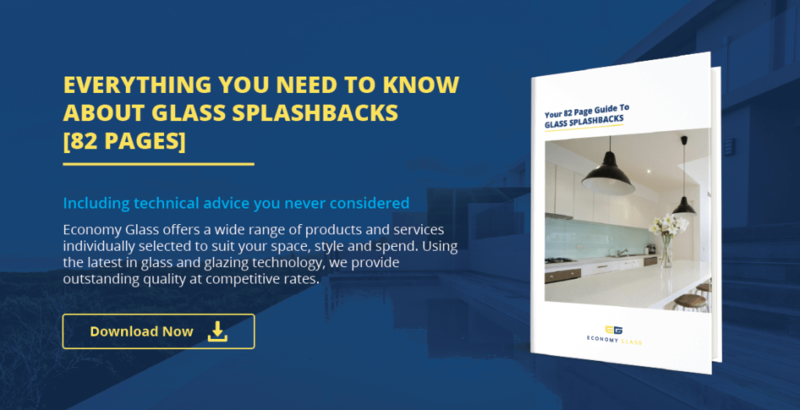 In this article, we examine these advantages in detail to show why a glass bathroom splashback works in the most important areas of the bathroom. Then regardless whether the tiles are ceramic or glass, you’ll need to grout them…and grout is notorious for being hard to clean. This is especially true in a shower space, which needs consistent care to remove soap scum, dirt and grime build-up. Grout is also susceptible to mould and mildew. If this type of grout damage occurs, it’s nearly impossible to clean with topical agents; they simply cannot penetrate deep enough to eliminate the problem. With glass, however, there are far fewer seams where mould or mildew can grow. Plus, you can coat the glass walls with EnduroShield for added mould/mildew protection that reduces cleaning time by up to 90%. The result: a unique shower feature that reflects light, feels spacious, provides strong resistance to mould/mildew, and is easy to clean. Glass bathroom splashbacks offer more than just wall protection; they can open up a new level of style and sophistication. By pairing a quality glass producer with a premium paint manufacturer, you can create a splashback feature that will make the chosen colour palette in the bathroom pop without fear of fading. In the bathroom below, for example, the glass combines with the paint colour and the white finishes to create a soothing, spa-like feel. In this type of application, paint choice is critical. Economy Glass use premium-quality Dulux Paints, so you can be assured your paint colour choice will be accurate, vivid and long lasting. A glass splashback can accent any bathroom wall. The accent paint colour gets applied to the wall or the back of the glass; either way it will stay vivid because it’s protected from the room’s moisture. Quality glass will have a low iron content, which means the colour choice will come through the glass in the intended way. You can also apply a tinted glass as a bathroom splashback accent. Designers have placed an especially high demand on our metallic and pearl finishes over the entire range of colours we offer. The glass transparency can be designed to fit the bathroom’s decor. Clear and frosted are two of the most popular choices. Lastly, designers can completely customise their splashback feature with art or digital imagery. The selection can be screen-printed and mounted on the back of the glass, creating a visually stunning wall panel. Similar to glass mirror splashbacks, using tinted glass behind the bathroom sink offers a stylish way to reflect light and add a sense of space to the room. And as the image below shows, you can still mount the sink fixtures directly through the glass bathroom splashback. This clever space-saving trick is a favourite among designers for 2017. Unlike the mirror option, however, a glass bathroom splashback over the vanity allows you to pair the feature with a framed mirror. It also has a lower risk of glare while still amplifying the room’s light. The glass needs exact measurements. Its quality should enhance colour palette choices, not detract from them. The splashback should fit the room’s style, not look like an afterthought. Generally speaking, tile splashbacks are less expensive than glass. Scheduling is perhaps the biggest consideration for builders. Because of the precise nature of the fabrication, it can take some glass companies months to design, fabricate, deliver and install the feature. This can lead to stressful delays and backups for other work. Economy Glass, keep large stocks of glass in-house. Our 700m2 factory has all the processing and installation equipment required for complex jobs. These advantages help us lead the industry in terms of fast turnaround times. We also have formed high-level relationships with the top glass suppliers in Melbourne to ensure we always deliver our products on time and to a high standard. A successful installation will make the bathroom stand out in the luxury home market. In fact, Ideal Home recently named glass wall panels as a top bathroom upgrade choice. Colours will be vibrant. The room will feel brighter and lighter. Most of all, the risk of mould and bacterial growth lessens. Looking for more ways to incorporate glass in your new home or renovation job? Contact us if you think a glass bathroom splashback may work in your next project. We’ll be happy to discuss the options with you.